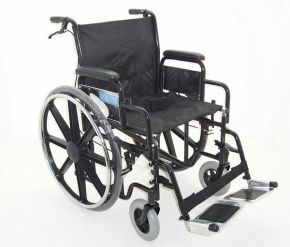 This heavy duty folding wheelchair is made by Z-Tec, a company that certainly knows how to make a good, durable wheelchair. It suits anyone up to 150kg or 24 stone in weight, and provides both security and comfort. There are both attendant and user brakes, and puncture proof tyres as standard. It's available in two seat widths (20 or 22 inch) for the best comfort and manoeuvrability for an individual user. Despite the very reasonable price tag, this is a very good folding option for those who need a heavy duty wheelchair. Removable padded under desk armrests. Swing away adjustable/ removable footrests with heel loops. Seat width 51cm (20") has a seat height of 50cm (19 3/4") with a single cross brace. Seat Width 56cm (22") has a seat height of (21 3/4") with a double cross brace. and they are just what I wanted.